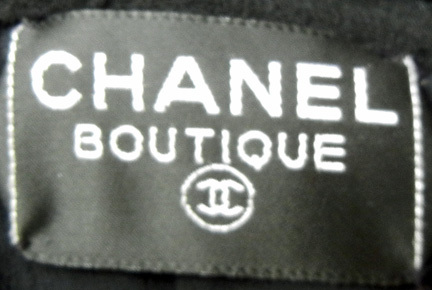 Description: Circa late 80's Chanel fine wool black crepe handpleated dress with wide spaghetti shoulder straps. Includes separate corset interior. Iconic weighty goldtone rolo link chain adorns upper bodice and encircles and fastens at back closure. Loosely fitted with hidden kickpleat on each side. A strikingly representative Chanel creation that is very representative Chanel fashion statement. Bust: to 34"; length: 60"
Has matching oversized Chanel bracelets. Ask for details.